Both Sport and Championship share some of the same trails. 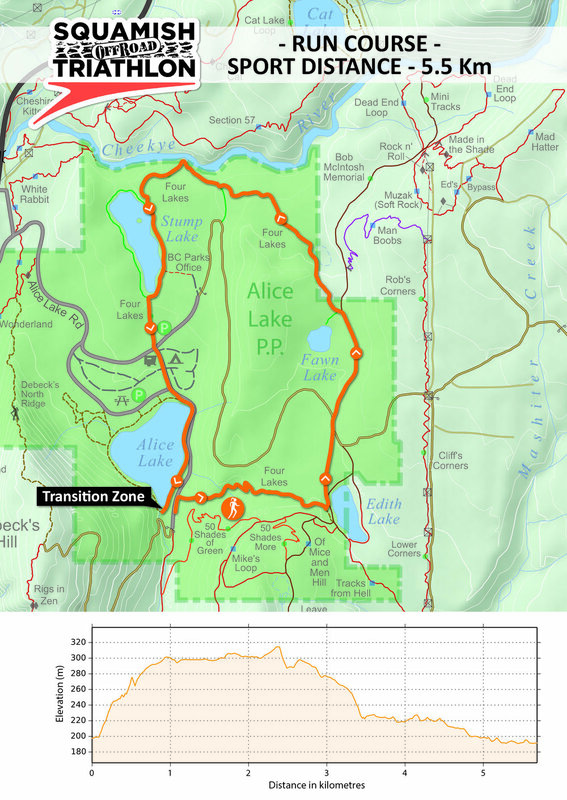 The Sport Course follows mostly the 4 Lakes Loop in counterclockwise direction. The Championship Course adds a few more challenging and technical trails. Exit transition at Alice Lake South Beach climbing up the 4 Lakes trail to Edith Lake. Both Championship and Sport course competitors follow the 4 Lakes Loop counter-clockwise. Race numbers must be worn on the front for the run. Appropriate signage will be in place at key intersections, the 5Km (Championshop course) and 1Km to go markers. Water and energy drink will be provided at all aid stations.